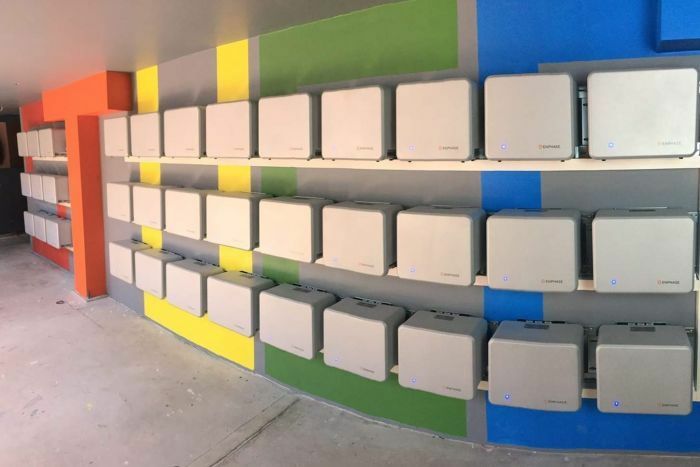 A solar energy storage system installed by a low-income student cooperative has reduced power bills for its tenants by around 55 per cent during its first year of operation. Former resident Dr Bjorn Sturmberg was the project manager of the Solar + Storage project when it was switched on at the Stucco student cooperative in Sydney’s Newtown in late 2016. His project team worked for 18 months to get the system running and originally aimed to reduce the tenants’ bills by 20 per cent. “It’s a huge success as I would say, and it’s delighting,” Dr Sturmberg said of the first year’s results. 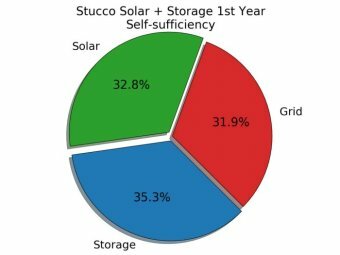 Stucco, which is run by full-time students of the University of Sydney, owns the solar system and batteries and sells the power generated to its tenants. The installation cost $130,000 which was aided by a $80,000 grant from the City of Sydney. In 2017 the system produced 41.5 megawatt hours (Mwh) of renewable energy — more than the 36.4 Mwh used by the tenants, with the excess solar power sold back to the grid. Dr Sturmberg said the system was making a return on investment of about 8 per cent and calculated it would pay itself off after 13 years. “Which is unfortunately a little bit longer than what the batteries are warrantied for,” he said. After graduating university, Dr Sturmberg was awarded a fellowship from the Myer Foundation to start SunTenants, a social enterprise focused on bringing solar energy to rental properties. On average, each tenant now pays around $240 for their annual power usage compared to an estimated $540 when solely purchasing from a grid retailer. Nursing student Cooper Adams is the president of the cooperative, where there are 40 tenants living in eight accommodation units. She has lived there for more than two years and said she was amazed by the cost savings. Edie Griffin is studying neurology and is one of two solar officers in charge of billing her fellow tenants for their electricity use. She said they used power conservatively at the heritage building where there are nine refrigerators and eight electric ovens. She said tenants were able to keep energy costs down despite the extended warm weather being experienced in the city. “We worked out for one particular unit, over a three-month period during summer, with an oven and a fridge, they were averaging paying $13 a week for that unit of five people,” she said.